I’m at Second Now Please Cast Your Vote! Hi! 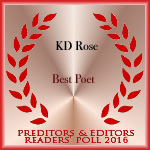 I’m standing at second now in the Preditors and Editors Readers Poll for poet so please cast your vote for KD Rose if you haven’t already. And if you have a chance or read some of these fine books and authors, take a look and vote in other genres too! Thank you!